If you thought Wi-Fi, Bluetooth or AirPlay speakers to stream your music was a sign of the convenience that modern technology gives us, then you will think LG's new Wi-Fi Music Flow speakers something out of a sci-fi movie or Ray Bradbury story. But, it is nearly here and it is for real – speakers that you can command, with a series of text messages. LG's latest Music Flow series of products take smart homes to the next level. All of the three new speakers (plus a battery-powered speaker and three new sound bars) can be connected to your iOS or Android smartphone for controlling your custom home audio system. 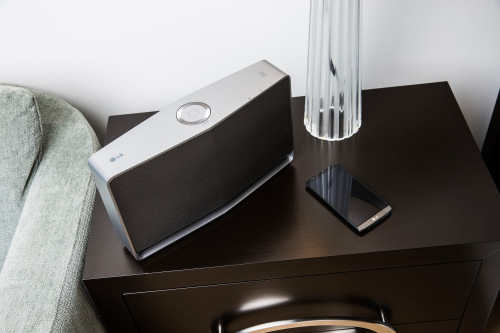 A twist to the product line is the ability to text your speakers using LG's Music Flow mobile app. Think of a house party where you have slipped into the kitchen for a refill and the playlist ends. What do you do? Send a message via the Line app to your speakers and text it to "play songs for party" to start up a pre-defined playlist for party music. "Good night" will gradually lower volume over ten minutes and then the speakers will stop playback. You can also send the speakers other commands like "turn off music after one hour", besides the standard play and skip commands. With all the world and Google moving towards natural language, this is a step towards making technology a bigger part of our lives than it already is. If this is not enough convenience, think of returning home on the subway listening to a song on your smartphone, and entering your living room to have your Wi Fi Sound Bar begins playing the same song. The Music Flow speakers have the capability to automatically play music from your smartphone when it is within range. It is not just music lovers on the go who will enjoy the benefits of the Music Flow speakers. Movie lovers will be able to enjoy a personalized wireless home theater experience. The Home Cinema Mode will connect the Wi Fi Sound Bar with the two Music Flow speakers as rear right and left channels for a complete and immersive surround sound experience. You can also set each speaker to match its position, to get the best sound. LG's Music Flow home audio lineup will offer multi-room music like Sonos, Samsung Shape and others without cords. The line includes a portable battery-powered Wi-Fi Speaker (H4 Portable), Streaming 3D Blue-Ray Player (BP550) and advanced Wi-Fi Sound Bars (HS7 and HS91). Each device will use dual-band Wi-Fi (2.4GHz/5GHz) to offer uninterrupted listening pleasure, unlike Bluetooth speakers. They will be able to work independently as well as via Android and iOS devices. LG's Music Flow apps for the two platforms will be able to access music or media from popular streaming services like TuneIn, Rhapsody and Spotify, besides CDs and USB devices. Additional LG HomeChat capability will also let you use the speakers as a PA to set alarms or alert you on upcoming events. Where can you get your hands on Music Flow speakers? For those of you who already have your credit cards out, it will still be a couple of months' wait before the speakers are available in the market. For now, you can get up and close with it at the 2015 International Consumer Electronics Show to be held in January 2015. So get your tickets to Las Vegas if you can, or wait it out!